This interaction through visual and auditory senses makes your brand stay for a longer time in your consumer's mind. Need to say more? Based up on the crowd around, we can customise the interation, i.e the frequency of interaction, the range of detection, and the direction of detection can be set according to the experience you want to deliver. You have a flexibility of using the backlit screen in two modes, one in continuously lit mode as a very normal one and the other one as lit up on presence. Your event or your premises, your way of communication. The Auto Volume Adjustment does communicate the message with very appropriate loudness. So that the your premises will retain their serenity without disturbances. When a detected person is near will relatively less volume and when the person is far with relatively loud volume. You can deliver mutiple audio message and that's not all... You can change the audio messages so easily just uploading your mp3 file into the micro SD card. 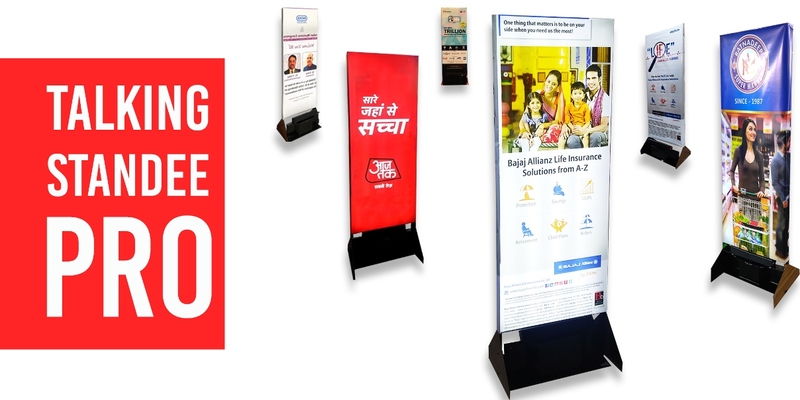 The foldability of the standee makes it easy to carry and also install within minutes. A creative activitiy with our Talking Standee can also stand as a story that can go viral in Social Media.